My Comments: Our economy is dying. And it has nothing to do with Republicans or Democrats. It has to do with demographics. A solution is to encourage immigration, a source of new people to add to the labor force, buy homes, buy cars, buy groceries, buy insurance policies, and everything else normal people do. Yes, there are going to be some bad apples, just like there are bad apples today. Think Timothy McVea, the white American Christian who killed 160 people a few years ago in Oklahoma. The challenge is similar to the one I teach people who are investing money; it’s not risk that is bad, it’s the inability to manage that risk that is bad. When it comes to immigration, it’s not the immigrants who are necessarily bad, but our inability to welcome the good ones and at the same time figure out how to screen for those who would do us harm. The consequences of dramatically limiting immigrants to this country is a slow economic death, and forcing hard working people who might otherwise be on a path to citizenship, is foolish and stupid. Especially if you think free enterprise with a goal of making money is a viable objective. If we are going to follow 45 and invest $1T in infrastructure, and at the same time reduce the existing $17T federal debt, we’re going to need lots of immigrants. The above chart shows that in 2015, there were only 62.5 births per 1,000 women of childbearing age. That fertility rate dropped even further, touching 62.3 births per 1,000 women, in the first half of 2016. To put the fertility rate in perspective, it is now at about 1.85 births per woman. To maintain a stable population requires at least 2.1 births per woman. 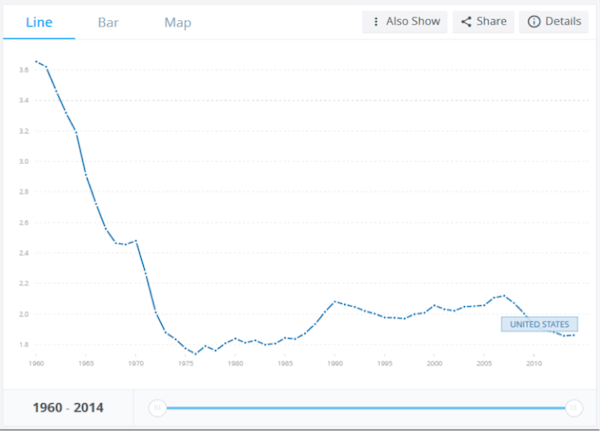 The US has been at or below the replacement fertility rate since 1972, as the chart below shows. Demographers worry that a dwindling birth rate will hurt economic growth and tax revenues needed to fund transfer payments to a growing elderly population. Some project that fertility rates will rise when the economy expands. If the Trump administration achieves higher economic growth, it’s unlikely to do so fast enough to support the mandated 9% increase in entitlement spending for older Americans without more deficit spending. Trump says he intends to preserve Social Security and Medicare spending levels, but he seems unaware of the demographic headwinds we are sailing into. Few policymakers grasp the profound impact of an inverting demographic pyramid, simply because it has never happened before. 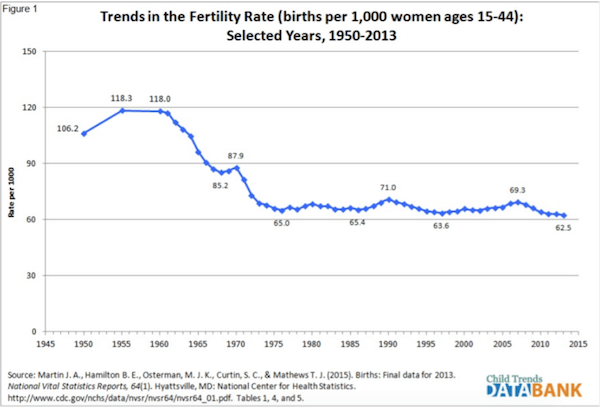 History does show, however, that there’s been a persistent downward ratchet effect in the US fertility rate: the downward movement may be temporarily interrupted, but then it resumes again. Moreover, this is a long-term trend. 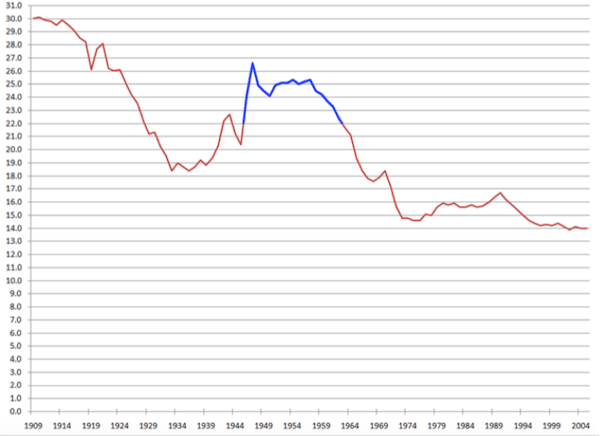 Fertility rates began falling prior to World War II, despite the temporary uptick that led to the baby boom (blue segment of line). This chart shows births per 1,000 people in the US. In short, the population dynamics that have broken the dependency ratio and created the unfunded liability crisis worsened in 2016. This dynamic won’t change fast enough to prevent a crisis that can only be fixed by extending health spans. With longer health spans, older people can live healthier and longer and be more economically productive. They can then support their own retirements instead of relying on fewer and poorer young people to do so.